Golden Voice’s Panorama Festival already unleashed the star-studded main stage lineup for their second annual end-of-July bash. With names including Nine Inch Nails, Frank Ocean and A Tribe Called Quest set to perform at the Randall’s Island festival, it was set to be like a full-on party—but today the Festival made it literal with The Point, which is being described as an “open-air club” which aims to celebrate New York City’s rich DJ culture and impact on the Electronic Music scene. How will The Point do that? With LED lights (of course), an all-day, all-night dance floor, and a multi-level dance area. Working Women, a Brooklyn-based DJ collective, will warmup each afternoon, then hand the reigns over to over a dozen DJs, including Theo Parrish, Motor City Drum Ensemble, Derrick Carter, Omar-S and many more. The Point will be operating with the Funktion One sound system, a state-of-the-art music experience used at some of the world’s exclusive clubs. 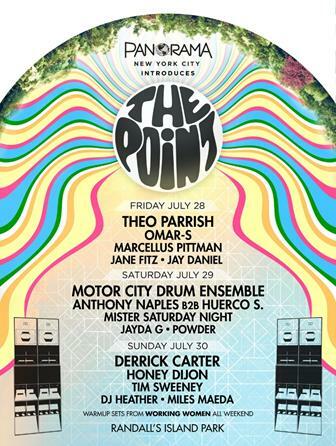 It looks like for the July 28-30th festival, the Panorama Festival will be bringing the club to their patrons. You can purchase 3-day and single day GA and VIP passes here.